I really wanted to get the baby’s room ready before Christmas and I’ve just about made it. 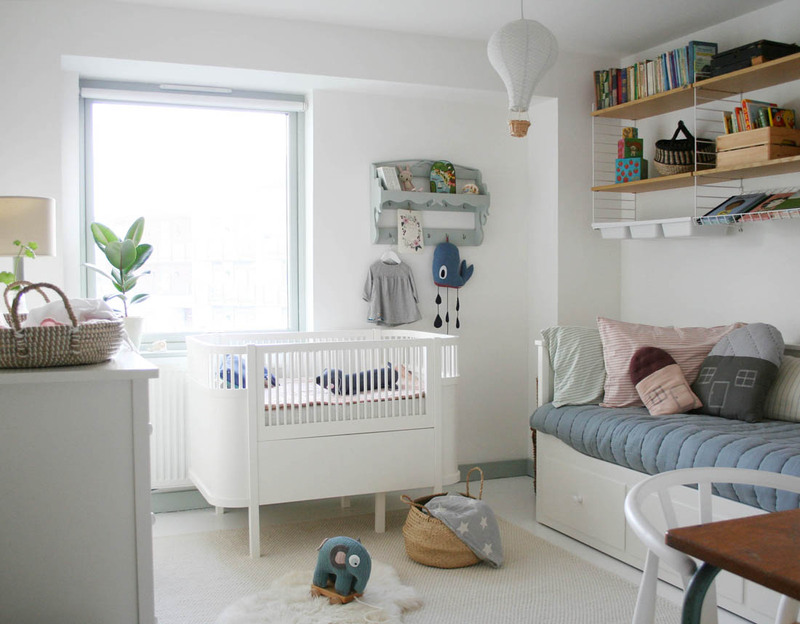 I have to say it has been the most difficult room that I have decorated to date and if I’m totally honest I’m not delighted with it because it has to serve as a nursery, guest room and work room so I never felt that I could create exactly what I wanted as there had to be so many compromises in terms of space and practical furniture choices, except the cot that I absolutely love. However, the most important thing is that it feels so lovely to spend time in this room as it’s warm, cosy and welcoming and it’s very, very practical with loads of storage and the space works well for the purpose. I’m sure it will change loads once the baby is here and it begins to fill up with toys and baby stuff – I don’t even know what that stuff will be yet! There are lots of empty shelves and drawers waiting to be filled and a little baby’s character to discover so I will definitely keep you up to date on how the space evolves in the next few weeks and months. I thought it would also be nice to get some proper photos done once baby is here so we can show her off at the same time. But for now, these pics will have to do…dark, dark days, a huge tummy and extreme tiredness are not conducive to good photos, I’m afraid! By the way, I have compiled a list of everything in the room so pop down to the end of the post to find out where everything is from. As you come into the room we have put my desk tucked into the corner, a day bed on the right, the cot under the window as this was the only spot it would fit but I reckon we will move it once the baby starts sleeping in here in a few months time, and a large set of drawers running down the left side of the room. I have also added a rug to make the room feel cosy. 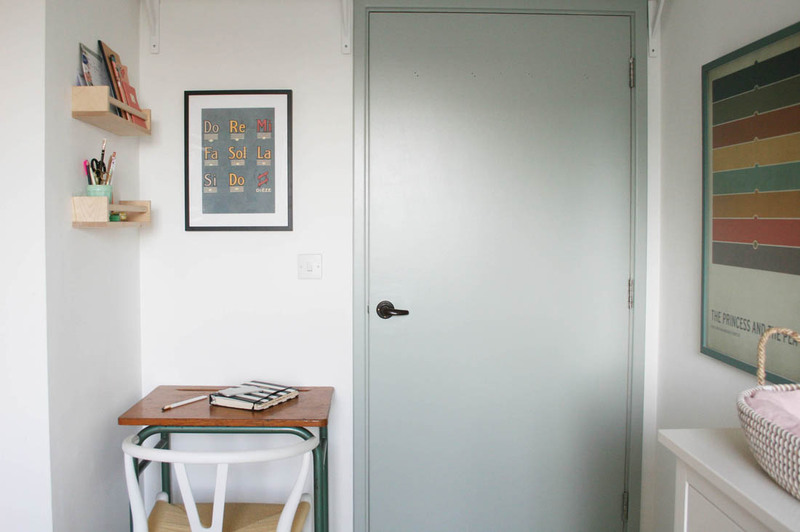 The only thing we have done to the room is re-paint the floor and touch up the walls (see that process in this post). We then painted all the woodwork including the skirting boards, window frame and ledge and the door in Farrow & Ball’s Light Blue. I used that colour as a basis for the other muted colours including blue, green and pink. The Sebra Kili cot bed is the first thing anyone mentions when they see the room for the first time. I love the Danish design. I decided to buy the baby a few toys before she arrives as it felt a bit sad to have a nursery with no toys or sweet things to look at. 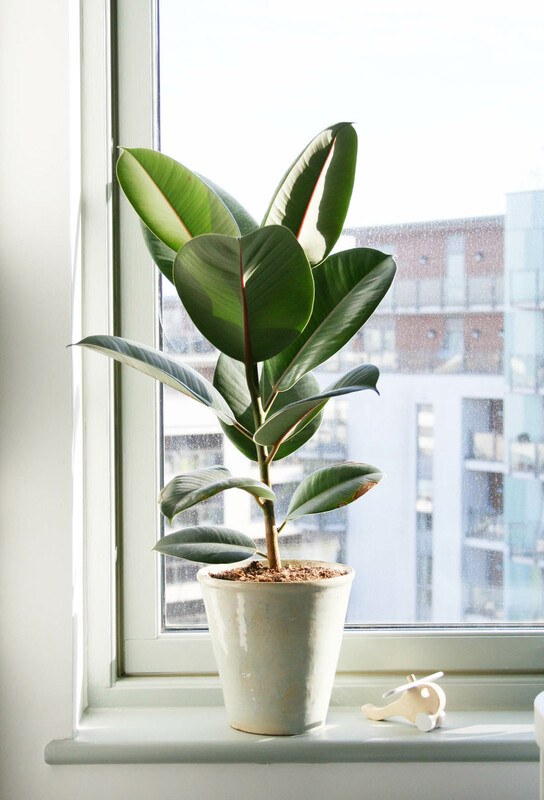 A big plant on the window sill helps to bring a bit of freshness. I painted the little vintage shelf unit that used to hang over our kitchen sink and it works perfectly in this room. I needed a large chest of drawers in this room as there was no space for a wardrobe. I changed the knobs to white porcelain ones. The large IKEA chest of drawers was a must for storage purposes. We did have the option of a beautiful vintage pine cupboard and I was soooo tempted but it just wasn’t practical. Jules, who doesn’t usually get very involved in choosing furniture, was adamant that I did two things in this room: add colour and choose practical furniture. Therefore, he won on the cupboard front and actually these drawers are ridiculously good for fitting loads in them. The top of the unit is perfect for a changing spot, too. 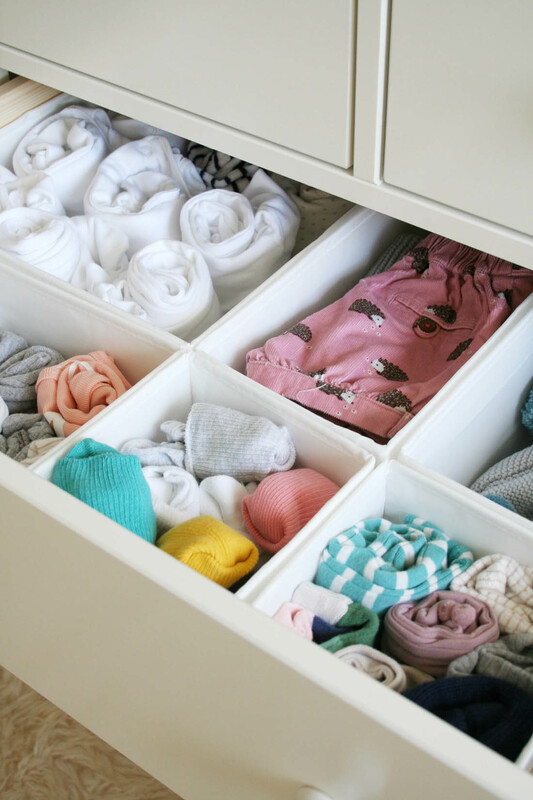 Drawer dividers are perfect for lots of cute little baby clothes. I love this changing basket that I have lined with a vinyl changing mat and popped a lovely muslin over it. I moved my pocket String shelf over to this side of the room. 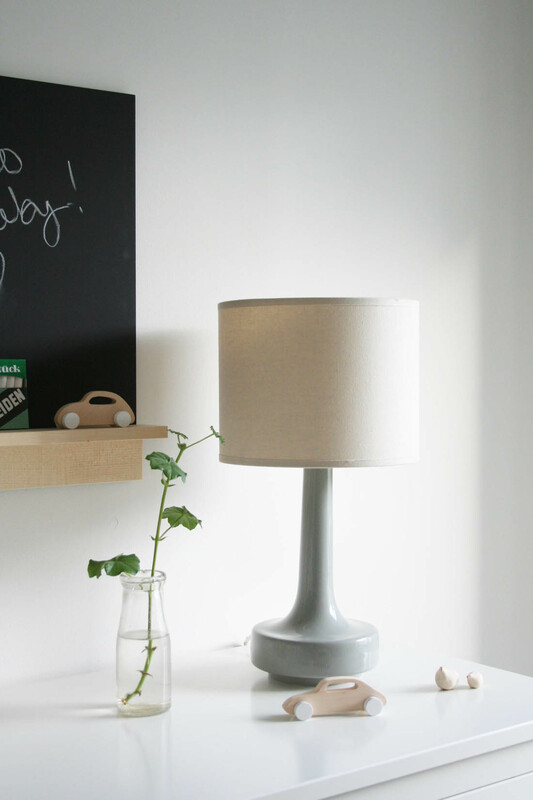 I wanted the lighting in this room to be really soft so I have kept this lamp that used to be in the home office. 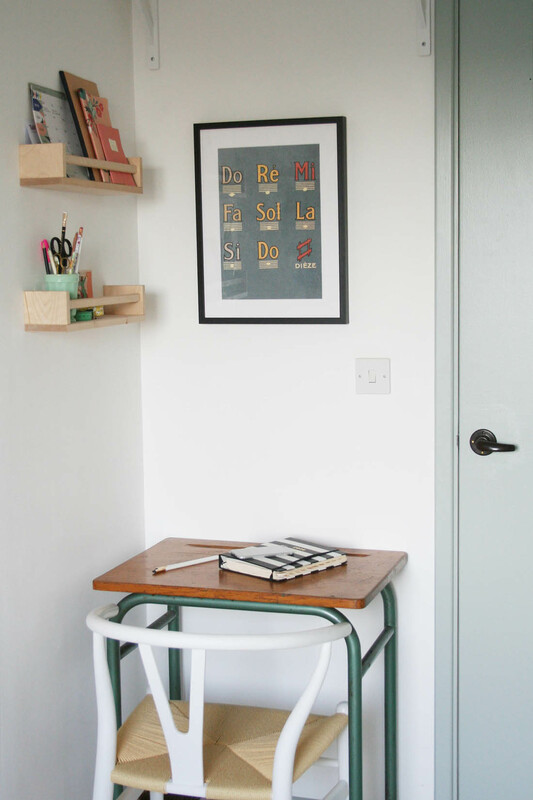 I was going to try to do without any desk space but I quickly realised that whilst I could it would be silly not to take advantage of this corner of the room where the vintage school desk from our hallway fits perfectly. It’s actually a really nice spot to work from. The wall facing the window was the perfect spot for a desk as it fits perfectly here. This vintage school desk used to be our hallway table. Again, we used Light Blue for the door and its frame. I used a couple of spice racks for my stationery as the desk is so small and hung my favourite Double Merrick print over the desk. It’s not ideal to have the cot under the window so we will probably have a shift around once the baby starts actually sleeping in this room. For now though the day bed takes priority as I’m pretty sure there are going to be nights where either I need to feed the baby in here or Jules needs to escape for a full night’s sleep. It’s also great to have space for family to come and stay. The rug brings so much warmth to this room and it fits the space perfectly. Another favourite addition is the hot air balloon lampshade that diffuses the overhead light so beautifully. 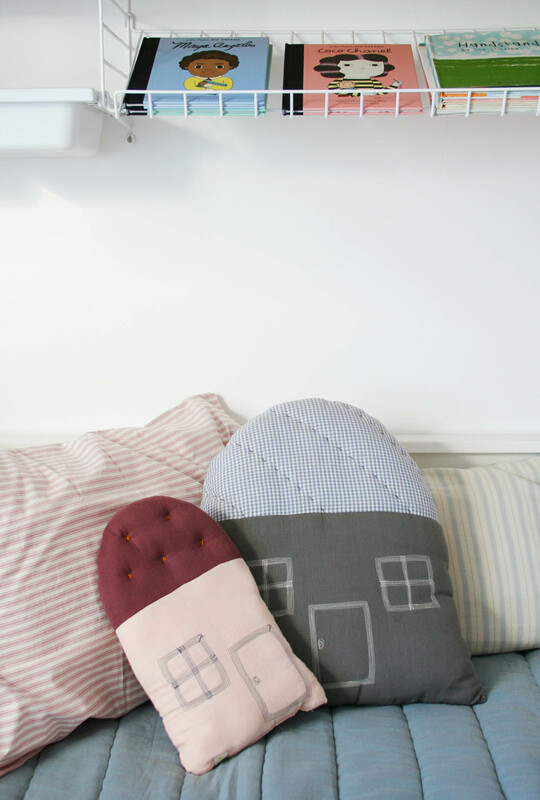 I wanted to make the daybed as cosy as possible so I covered it in a quilt and lots of pillows and cushions. On the right of the daybed there was a blank bit of wall and I thought it would be nice to have this string of lights here for night time feeds in a few months so I wouldn’t need to put on the main light. 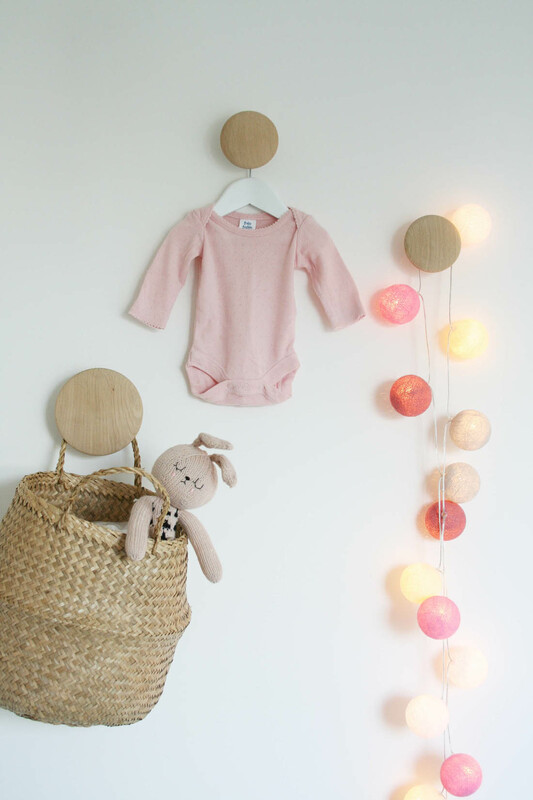 The Muuto Dot coat hooks are perfect for hanging the lights on. I have bought a few toys, books and decorative objects for the baby that she won’t be able to play with for AGES but nice to have a bit of visual stimulation, I thought. But, as you can see, there is lots of space for more! The cot is my absolute favourite thing about the room. 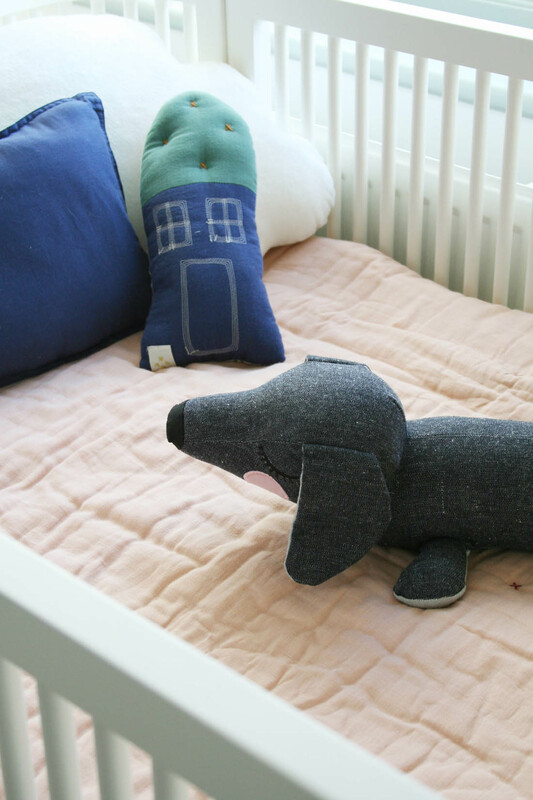 I will tell you more about it when the baby starts using it but it cleverly extends to a toddler bed and a child’s bed that will last until she is 7 years old. 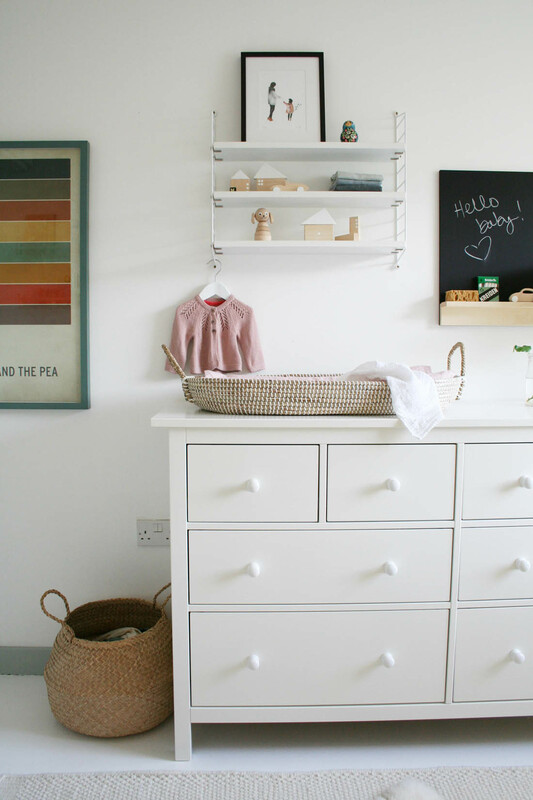 I’m sure these shelves above the changing basket will fill up with cotton wool and nappies in no time at all and the pretty wooden toys will be banished to a drawer somewhere! 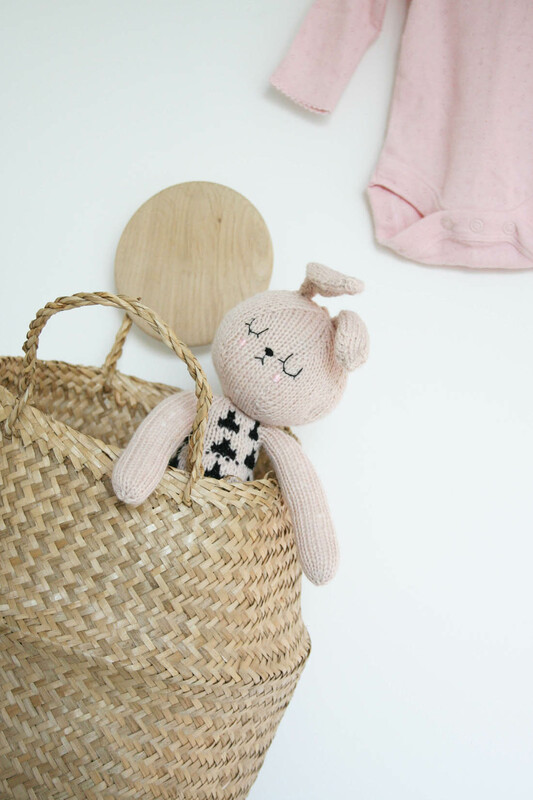 Love some of the soft toys I have found like this bunny. 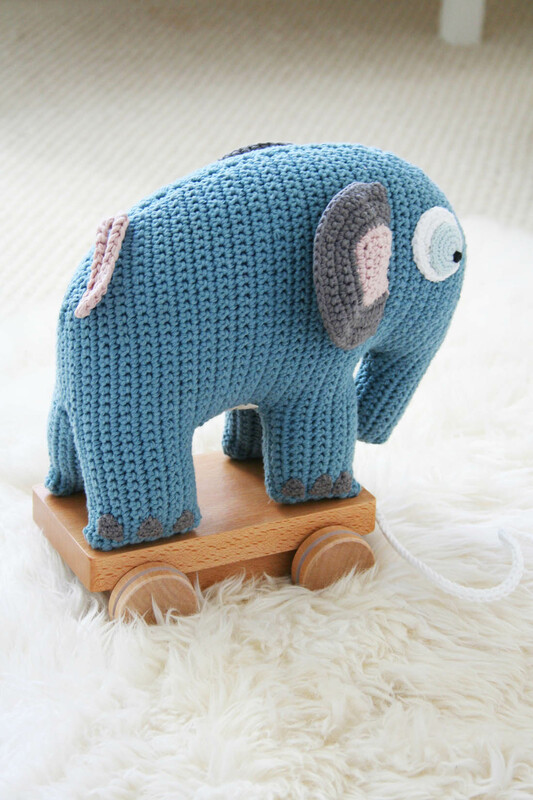 And this Sebra elephant on wheels is my fave. So, nursery is done, baby’s clothes are washed and folded, pram and car seat have been bought and we have a crib ready in our bedroom. All that remains is for this baby to arrive in three weeks – we can not wait to meet her! *Do let me know if there is anything else that I haven’t mentioned that you would like to find out more about. Next Post My house is in a book! Itlooks realy nice and brautifully styled-very happy for you! Katy this is absolutely stunning!! What a beautiful room and perfect do your new arrival. All the best for this exciting time for you. I love the blue tone and the small details scattered throughout the room, a very balanced set. I can not wait to see her. Congratulations! I actually teared up reading this post because I am SO excited for you! 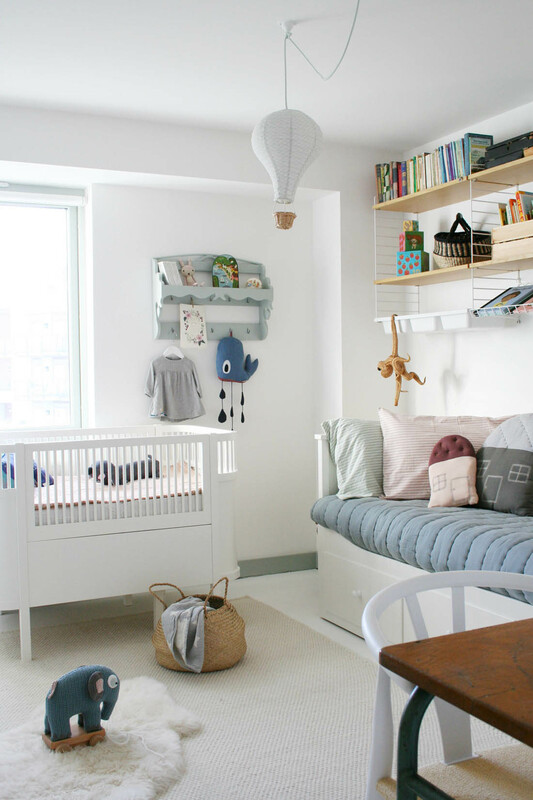 This is a gorgeous, light-filled space and I absolutely love that cot. Can’t wait to meet the lucky lady who’ll be claiming this room soon. Oh I totally understand your dilemma! When I was pregnant we made one bedroom an office/guest bedroom and the smallest room a nursery. Now that my litle girl needs a bigger room, we’re swapping the lot and it doesn’t quite work! What a light bright room. Such a treat. Don’t forget a sling or baby carrier, they much prefer being close to you when the are little! Beautiful nursery Katy, I am so exited for you. It’s looking lovely and I think you’ve done a brilliant job of making the room multi-functional. Good luck and I hope all goes well for you! This is absolutely beautiful. 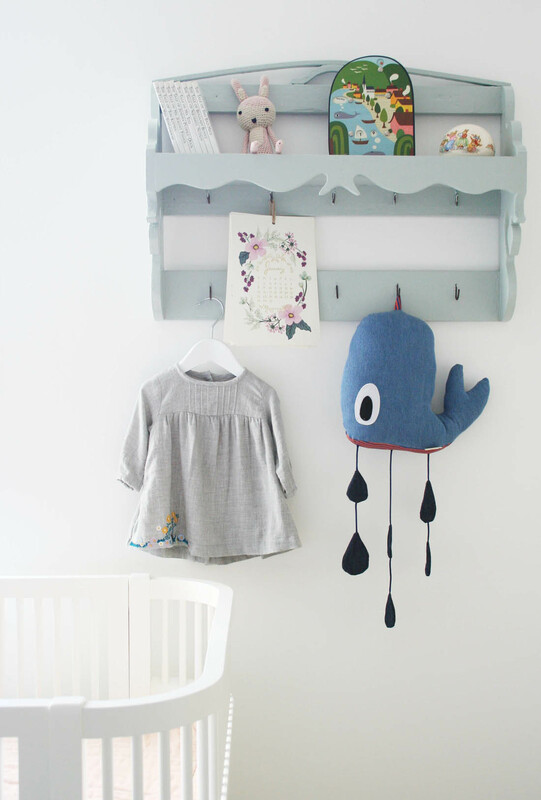 The perfect room to welcome your little one and guests! 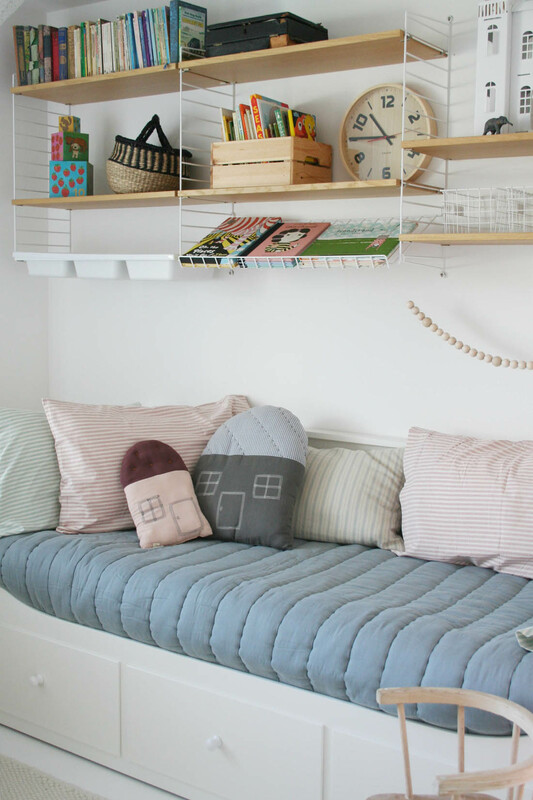 Very clever use of space, and I am sure there will be times you will appreciate the daybed yourself! Stunning. I love the white room. I love what you’ve done. I particularly like the string shelving (what type of wood are the large shelves? ash or oak?). And where did you get the animals in the paper dolls house? 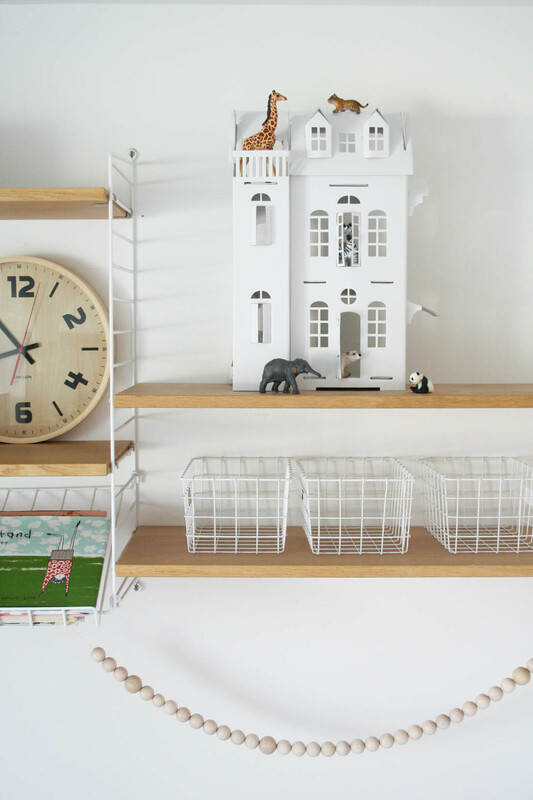 Hi where is the small book shelf/coat hook piece from please! Lovely room! This is so sweet and lovely, I’ll be taking inspiration from this! Love it. 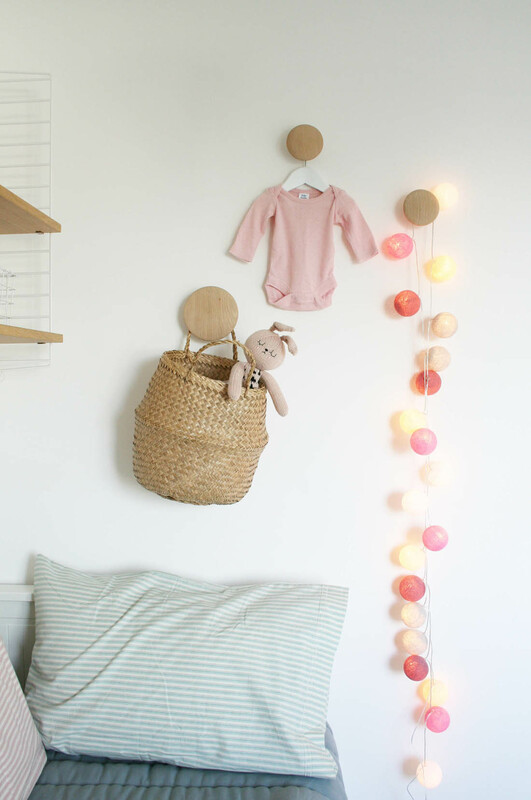 A beautiful and cosy nursery, you have certainly inspired us for when our little one pops out this June. The hot air balloon is adorable. Love how you mixed different accessories and toys and everything fit in so well together. Can I ask which hemnes Ikea drawers you went for are the ones with the slight shine to them or the Matte white ones? I am currently decorating a nursery and thought the drawers looked great. 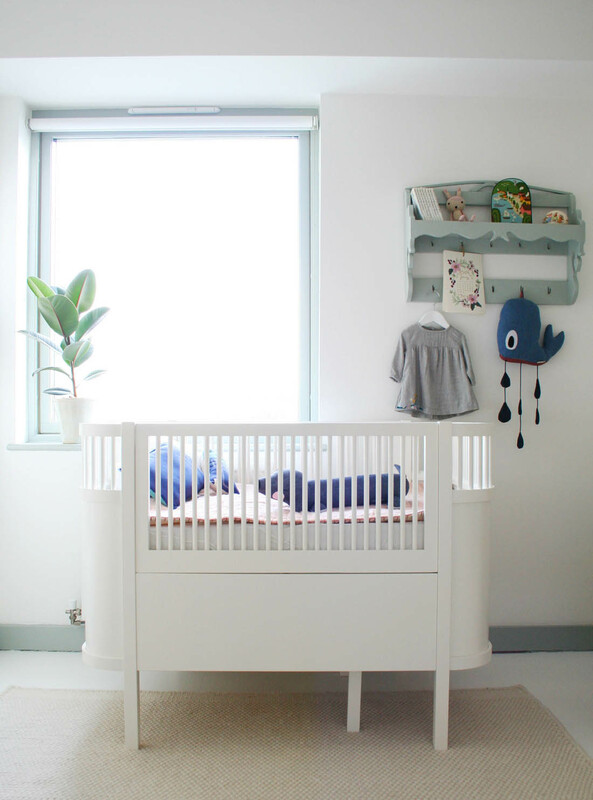 Your nursery is so gorgeous – can’t wait to see what you do with the new house! Can I ask what size/make vinyl mat fits in the changing basket please? Very tempted to buy it! Hi! Where did you get the vinyl insert for the Reva changing basket? I’m looking for one for my basket! Thanks!